This is probably the best time ever to be a basketball player, be it a professional or a casual one. In the 70’s we had Kareem and Erving. Great players, but the game was yet to be globally popular. In the 80’s we saw the rise of Magic Johnson, Jordan, Isaiah Thomas, Bird, etc. They elevated the game to another level and showed us the potential and the promise of basketball as a global phenomenon. Then the 90’s came and the basketball became an industry. Thanks to great players with incredible talents, and in great part to their flamboyant personalities (Barkley, Rodman, Jordan, Kemp, etc. ), the transformation of basketball was completed and here we are, 20 years later, still reaping the benefits. There are now more than 20 basketball players with their own recognizable brand styles and custom gear made by Nike, Under Armour, Wilson and others. The reason I took this digression is very important to the subject at hand. While back in the 70’s and 80’s e had just a handful of companies that made basketball related clothing and equipment, nowadays there are at least a dozen of them that that are doing it with perfection. Hence the statement once again: this is probably the best time ever to be a basketball player. Now let’s talk basketball backpacks. 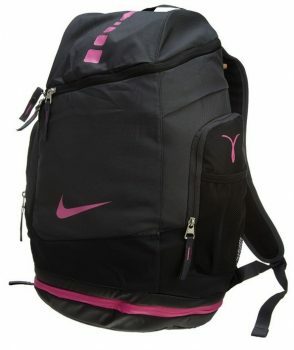 For both casual and professional players, a basketball backpack is practically a necessity. The sport requires a couple of bulky items (shoes and balls to name a few) that you cannot really play without. 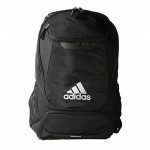 There are a couple of things you should consider when buying a basketball backpack and I will outline some of them in this short guide. Most of the players carry a lot of the equipment with them. Shoes, a ball, spare shirts and shorts, towels, socks, a water bottle, etc. 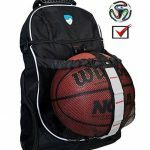 This is the first criteria you should be thinking about when buying a basketball backpack. 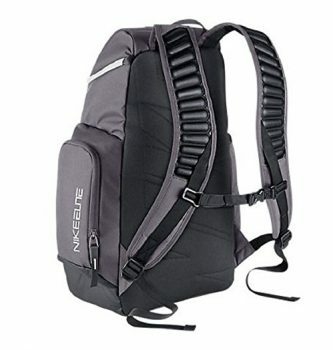 If you are carrying a lot of stuff, consider getting a backpack that allows you to store all of them, preferably with multiple pockets on the sides. You wouldn’t want to have your wet socks pressing against your clean towels and shirts in the same compartment. By all means, basketball is a men’s game. That’s not to say that women don’t play it and that they shouldn’t, it’s just that it is a contact sport. So, everything you use for it is getting worn and torn. That includes backpacks as well. When buying one, consider the amount of time you will be using it. Let’s say you play at least 3 times a week. That means you will be opening and closing those zippers at least 100 times every single week. See what I mean? And you should think about how long will you be using it for; a year, two, ten? Everything you wear and own these days reflects your personal style and basketball backpacks are no different. And it is also the criteria most of you will use when buying a new one. OK, it is understandable and certainly important. But one thing you should also consider is how will it look dirty or when it gets worn a bit. I only say this because I was foolish enough to buy a white backpack once. Well, this is an obvious one, but I would urge you to think about it in a slightly different way. Instead of simply looking at a price tag, think about all of the factors above, and then look at your backpack as an investment. For example, if you plan on using it for at least five or six years, it is worth shelling out a pretty penny if it can support that lifespan. Fashionable design allows to use it on a daily basis for all your needs. So, now when you know what to look for, let’s find a couple of backpacks and see how they answer to these requirements. 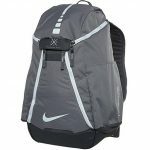 Nike Hoops Elite Max Air Team 2.0 Basketball Backpack features a modern design and top quality materials. It comes in a variety of colors and a uniform size. With one large main compartment and a couple of side pockets, you will have enough storage room to carry all your equipment. There is also a neat feature – a wet/dry compartment that will keep your clean and dirty gear away from each other. Quad zip feature makes it easy for you to open it up from any side and shoulder straps are equipped with Max Air padding. 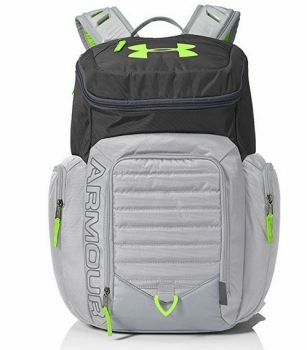 Under Armour Storm Undeniable II Backpack is not actually a backpack designed for basketball. On the other hand, it is one of the best universal backpacks on the market and it offers some pretty neat features. For starters, it features a polyester UA Storm technology that makes it element-resistant and durable at the same time. All the panels are reinforced and padded with foam so that your stuff inside, like a 15″ laptop it can fit, stay protected. The bottom side is made from an abrasion-resistant material and high-quality zippers are protecting the 4 outside pockets. 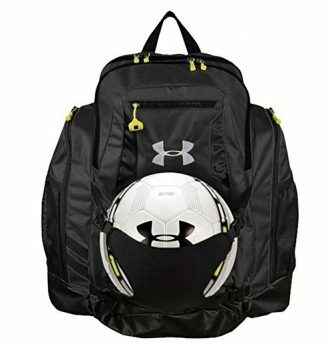 Under Armour UA Striker II Backpack Bag is one of the most popular backpacks on the market, and for all the good reasons as well. It features a spacious main compartment with a couple of big side pockets, small outer holders for your valuables and an exterior ball holder. Incredibly well built with DWR Treated 600D polyester coating, this backpack is one of the toughest and most durable ones in the segment. 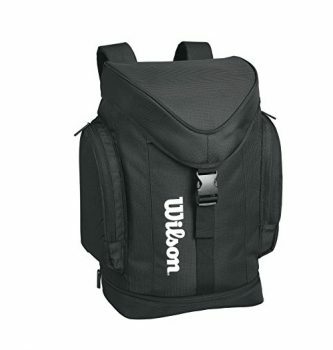 Wilson Evolution Basketball Backpack belongs to a mid-price range, but it offers a great build quality and design. The main compartment is big enough to hold a ball and shoes, but you also have a padded pocket to fit a laptop in there. 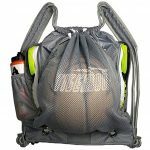 Two zip locked side pockets will easily hold a standard water bottle and some other things. There is a special compartment on the bottom side where you can store your wet gear and keep it away from the dry one. 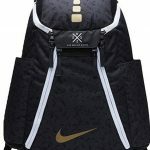 Nike Hoops Elite Max Air Team first version backpack certainly belongs to a top-tier class of basketball backpacks on the market. This spot is deserved with excellent build quality, beautiful design and by offering plenty of storage space. There is plenty of space for your gear and you can easily fit both shoes and basketball with room to spare. For your other gear, there are a couple of side pockets that offer great usability. A durable water-resistant material is used for this product and it offers an excellent level of protection even in the heavy rain and snow conditions. We tried to cover all segments of the market. 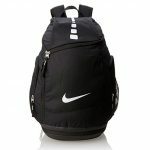 Finding a basketball backpack that fits your needs and your price range can be a daunting task. But then again, if you pick any one from our list, you will certainly be quite happy with the price-quality ratio. Since this is not a major investment, there is no need to brainstorm and torture yourself about this issue. Will I be using it only for sports? What is the feedback from the people who already own it? Pick a couple of these and any backpack that offers the satisfying answers will be a smart buy. It used to be the case that only the premium brands offer top quality products, but the competition is much stiffer now. You should be able to find a backpack that you really like with little to no effort, and if you can’t, simply pick one of these we reviewed for you.